Heat grill. In small bowl, combine all topping ingredients; mix well. Cover; refrigerate topping until serving time. Sprinkle both sides of each steak with seasoned salt and garlic-pepper blend. Brush both sides of onion slices with oil. When ready to grill, place steaks and onion slices on gas grill over medium heat or on charcoal grill 4 to 6 inches from medium coals. 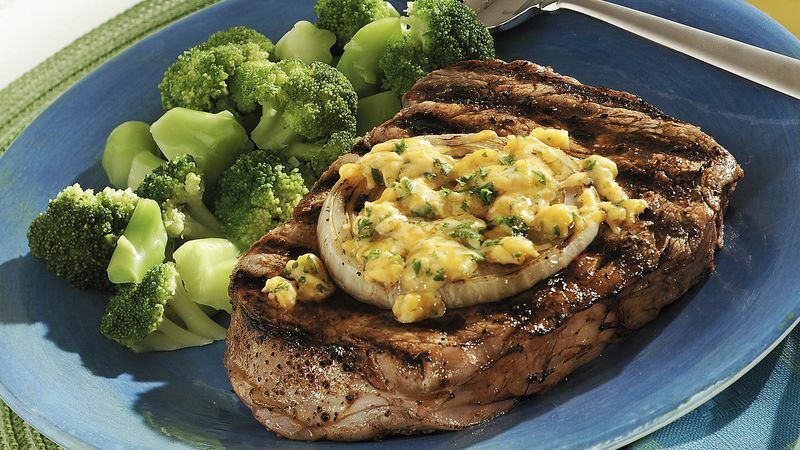 Cook 8 to 12 minutes or until steaks are of desired doneness and onion slices are charred and tender, turning steaks and onion slices once or twice. To serve, top each steak with onion slices and spoonful of topping. To broil steaks and onion slices, place on broiler pan; broil 4 to 6 inches from heat using times above as a guide, turning steaks and onion once or twice. Dinner time should be family time. Start by making dinner a whole family activity: dad grilling, older kids chopping parsley and younger kids mixing the topping.